This work addresses the implementation of a mobile Augmented Reality (AR) browser on educational environments. We seek to analyze new educational tools and methodologies, non-traditional, to improve students’ academic performance, commitment and motivation. The basis of our claim lies in the skills improvement that students can achieve thanks to their innate affinity to digital media features of new Smartphones. We worked under the Layar platform for mobile devices to create virtual information channels through a database associated to 3D virtual models and any other type of media content. The teaching experience was carried out with Master Architecture students, and developed in two subjects focused on the use of ICT and Urban Design. We call it Geo-elearning because of the use of new eLearning strategies and methodologies that incorporate geolocation, allowing receiving, sharing, and evaluate own-generated student’s proposals, on site. Redondo, E. [et al.]. 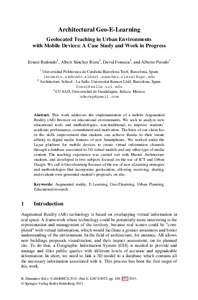 Architectural geo-E-learning: geolocated teaching in urban environments with mobile devices: a case study and work in progress. A: International Conference on Virtual, Augmented and Mixed Reality. "Virtual, Augmented and Mixed Reality. Systems and Applications. 5th International Conference VAMR 2013. Part II". Las Vegas: Springer, 2013, p. 188-197.